Could I possibly write another post of Armando’s hair, or lack there of? (see original post here). Oh, yes I can! My poor, dear hubby…he just gives me such fun stuff to write about! So, it all started when I found out that he had an appointment with an Image Consultant who was a guest speaker at one of Armando’s MBA classes. She had offered all the students a free consultation and Armando took her up on her offer and booked an appointment. After a one-hour session, he learned that it would take approximately $3000 for her expertise and $5000 for a new wardrobe to whip him into GQ shape. I kyboshed that idea but did offer the alternative of paying me the $3000 and I could whip him into runway form but he didn’t go for it. Instead, he decided to stop at the local barbershop. He always trims/shaves his own hair so he figured if he got it professionally done, it would be a drop in the bucket of his recommended $8000 makeover. It had been eons since he got his hair professionally cut so he took a quick glance at the price list before committing. $18…perfect! Armando loves the deals. 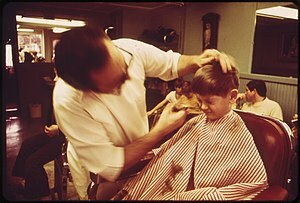 So after a wash, a clip and a shave, Armando walked up to the counter to pay for his newly clean-shaven look but when the girl said, “Fifteen dollars, please,” he was confused. He was sure the adult price was $18. As he looked at the price menu again, he noticed that the adult price was $18 but the senior rate was $15. Senior rate! I could not hold in my laughter when he told me! Poor guy didn’t have enough hair to warrant the adult price. Regardless, he’s on his way to GQ status and at a discounted rate!